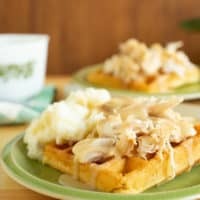 Amish Chicken and Waffles (PA Dutch Chicken and Waffles) | Good. Food. Stories. If you’re looking for Amish chicken and waffles, also known as PA Dutch chicken and waffles, you’ve come to the right place. Brace yourself: we’re about to travel deep into the hinterlands of Pennsylvania once again for one of those “only in PA” culinary specialties that surprise and mystify the population at large. These chicken and waffles are not the famous Southern version with fried chicken and maple syrup, but the kind I grew up eating with roasted chicken, yellow gravy, and sometimes, for that extra helping of carbs, a scoop of mashed potatoes. An Amish/Pennsylvania Dutch specialty, this curious compilation is seen more frequently in the towns east of Pittsburgh, where it pops up on local restaurant and buffet menus from State College to Lancaster to Reading. Unlike Michele’s experiences, this wasn’t a meal served at home for my family. Amish chicken and waffles were a special-occasion food, a delicacy available when we gussied ourselves up to go to the Oakhurst Tea Room in Somerset, which has been serving the dish since 1933. It was also often the closest I came to religion. The dish has always been a staple of Pennsylvania church and community fairs, served in the cool linoleum-floored basement meeting halls as a fundraising tool and counterpoint to the fresh-squeezed lemonade and Slushies from the outdoor booths. Despite not being Catholic, I ate my fair share of chicken and waffles from St. Benedict’s church on Bedford Street, tagging along with friends during our summer vacations. Once we moved closer to Pittsburgh and further away from the more traditionally rural Pennsylvania Dutch communities, chicken and waffles fell off my culinary radar. I got my driver’s license and spent weekends eating Denny’s caesar salad and seasoned fries (with a side of caesar dressing for dipping! ), Boston Market side item samplers, and Eat n’ Park clam chowder with friends, forgetting my food roots as so many teenagers do in favor of the communal booths of chain restaurants. Now that I’m older and look at my upbringing through a nostalgic lens, I think it’s time to bring Amish chicken and waffles back to prominence. Though the Amish chicken and waffle combo has been spotted as far south as Baltimore, it sadly hasn’t made the leap to nationwide fame. While I understand the appealing mash-up of fried, salty, and sweet that’s brought Southern chicken and waffles to icon status, the “epic comfort food” (as Michele calls it) deserves a bigger place at the table. Why don’t more Pennsylvania-bred chefs tweak it for their menus and give it an upscale spin? Meat and Potatoes, the downtown Pittsburgh gastropub, does a “Nashville hot” or “Pittsburgh ranch” version with maple syrup for brunch, but without gravy. The Coop food truck also sticks to the fried chicken version of the dish instead of embracing the local heritage. At least I can continue making Amish chicken and waffles at home with the remnants of my roasted chicken, a quick batch of waffles, and a pan of poultry gravy—it’s gotta be creamy, and it’s gotta have that golden hue. Nothing’s more comforting to a Pennsylvania girl. Watch the video and see the recipe below for all the details. 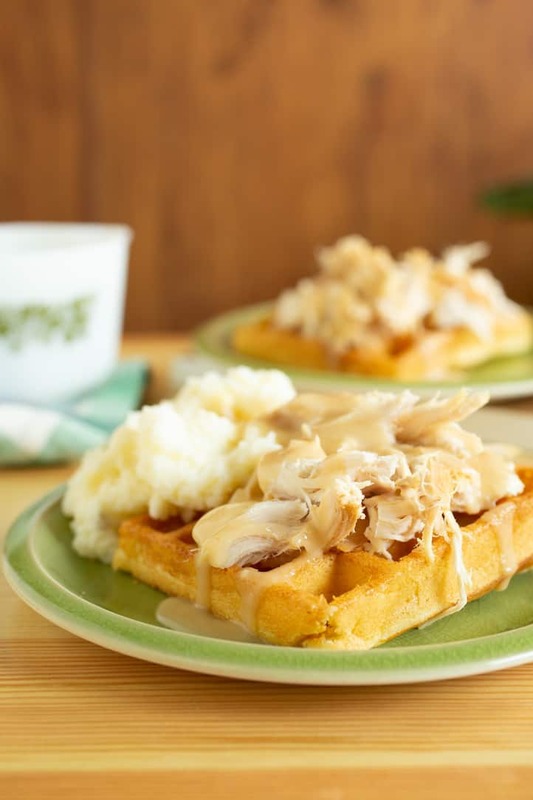 Amish chicken and waffles done the Pennsylvania Dutch way means roast chicken on a waffle with creamy gravy. It's epic comfort food. Pull the meat from the roasted chicken and cut or shred into bite-size pieces. Keep warm in a 250-degree oven until ready to assemble and serve. Preheat a 4-square waffle maker. Separate the egg yolk and white, and reserve the egg white in a small bowl. Melt the butter in a small saucepan and remove from heat to cool slightly. Whisk the egg yolk and milk together in a large bowl. Add the melted butter, flour, baking powder, sugar, and salt to the egg and milk. Whisk together until just barely combined; some lumps may remain. Beat the egg white by hand or with an electric mixer until soft peaks form. Gently fold the egg white into the batter with a spatula. Grease the waffle maker, if necessary, and pour the batter evenly into the waffle iron. 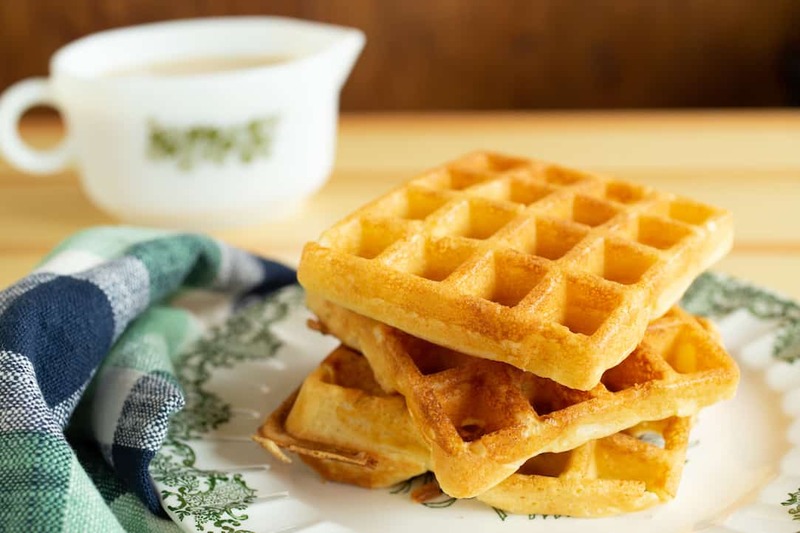 Depending on the depth and size of your waffle maker, you may have a bit of leftover batter. Cook according to your waffle maker’s specifications. Melt the butter in a heavy-bottomed saucepan or deep skillet over medium-low heat. Sprinkle the flour evenly over the melted butter and whisk to incorporate into a roux. Cook, whisking frequently, until the roux turns toasty golden. It will remain pale for a few minutes, then toast quickly, so keep an eye on it. Drizzle in the chicken stock, whisking constantly as it’s added. The flour will clump, but continue to whisk and the gravy will smooth itself out. Add the half and half and cook, stirring frequently, until the gravy thickens and comes to a simmer. Remove from the heat and season with salt and pepper to taste. 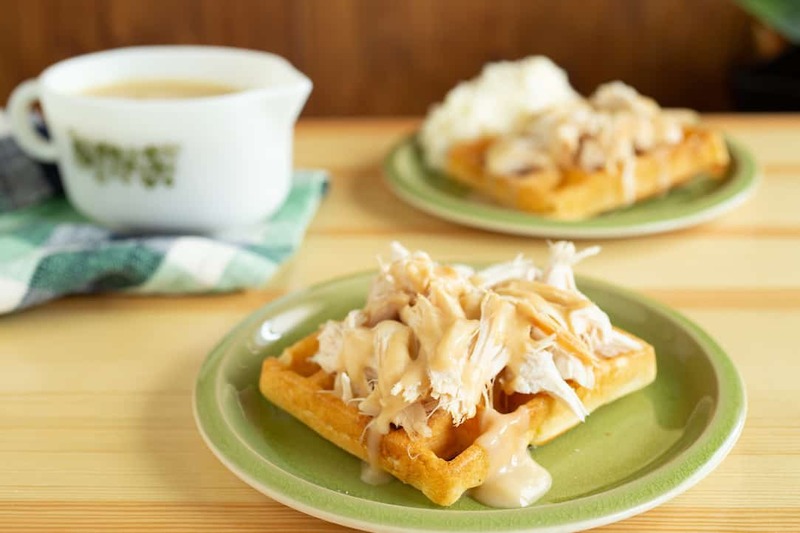 Place a waffle on a plate, top with shredded roast chicken, and drizzle with gravy. Add mashed potatoes if you’re into it. That’s all you need.